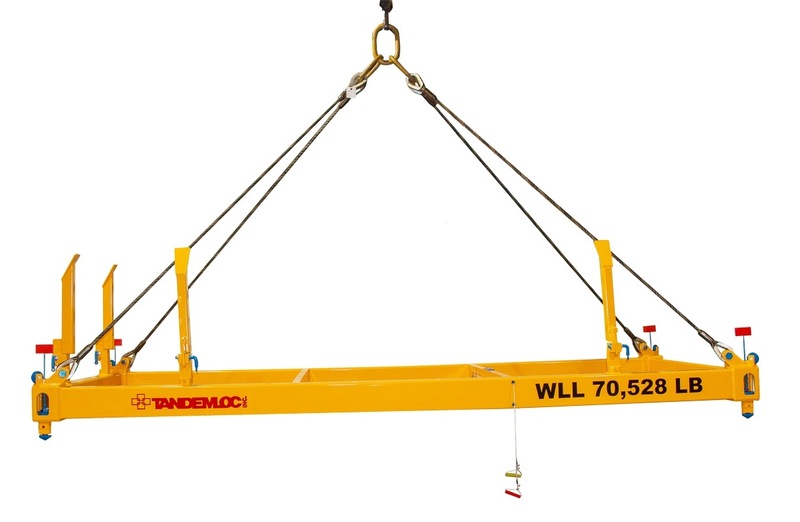 Tandemloc Manual Container Spreaders are used when our Autoloc feature is not necessary for container engagement. Such applications include but are not limited to - container loading and offloading: whilst at sea, offshore oil rig platforms, and ship to ship transfer (such as DOD supply ships). .
WORK LOAD LIMIT (WLL): See chart below. PROOF TESTED: 125% of WLL, w/proof test certificate. CALCULATED WEIGHT: See chart below. STANDARDS: Specification #EAD21000A applies. 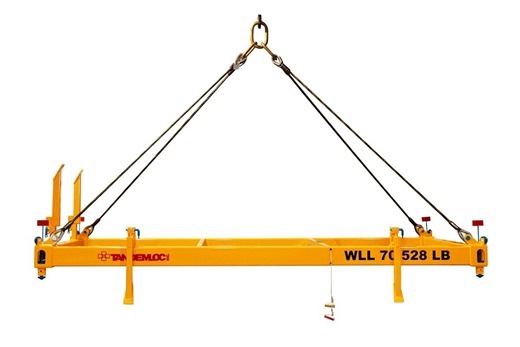 Spreader meets or exceeds AISC fatigue life of 600,000 cycles. OPERATION: Simple mechanical operation - no electronics or hydraulics. Twistlocks lock / unlock when wire rope handle is pulled. One handle locks the bayonets, the other handle unlocks the bayonets. 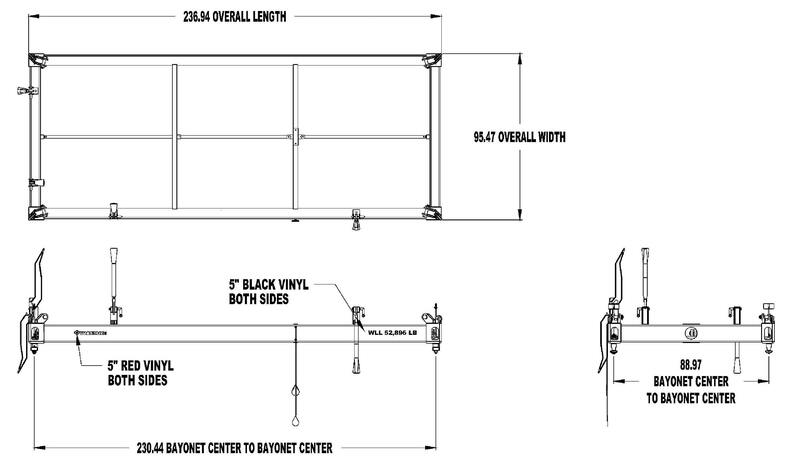 Double horn hook wire rope comes standard with frame. If you require a four legged bridle, let us know. 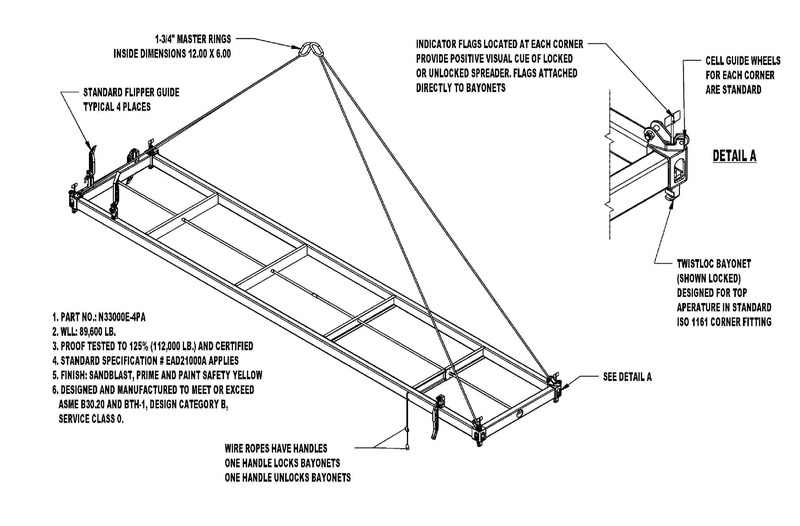 Wire rope rigging has a "Flemish Eye" style termination point, which has been found to be most reliable and recommended by FEMA over any other style termination point. 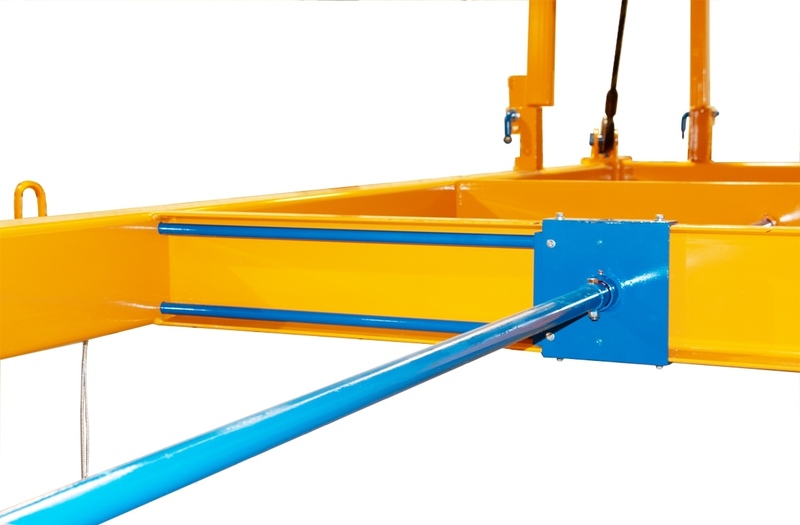 Built-in "Flipper Guides” allow the crane operator to easily locate the spreader onto the waiting container. Indicator flags located at each corner of the frame provide a positive visual cue of locked or unlocked spreader. These flags are attached directly to the bayonets. 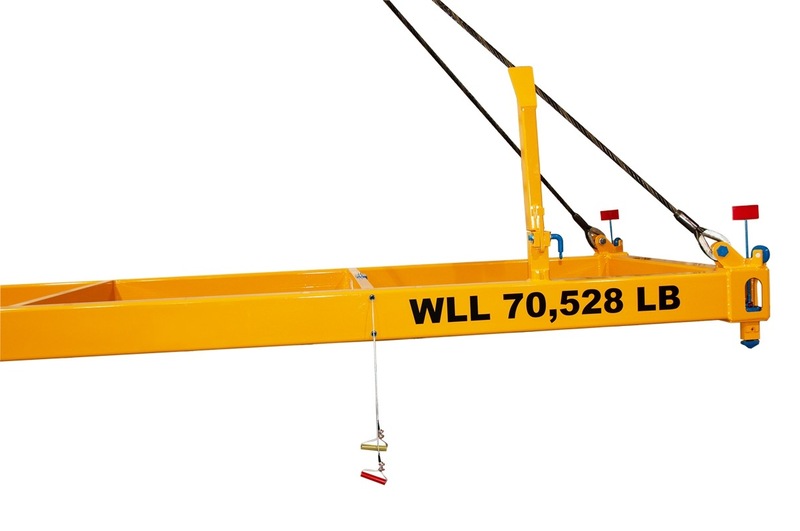 Click here for Lift Beam that turns your Autoloc into a Non-Containerized Cargo Lifter. 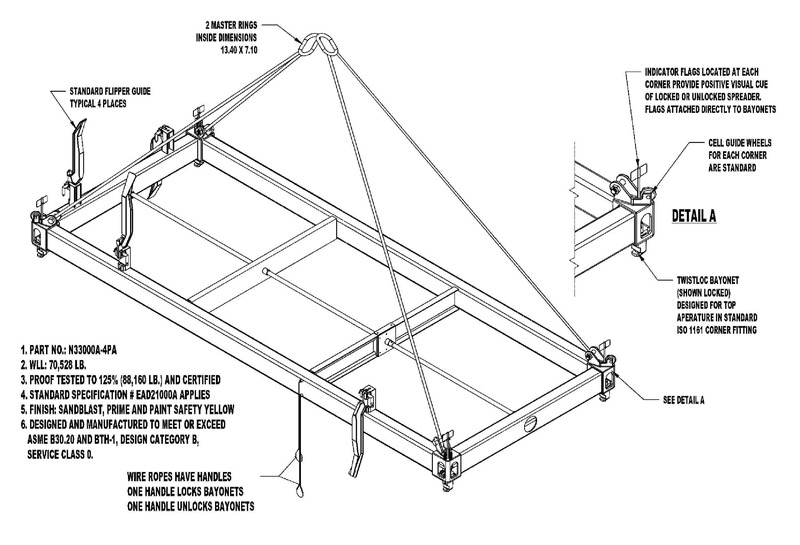 Download PDF maintenance manual shipped with spreader. Autoloc® Spreaders have 4 twistlock bayonets which are simultaneously actuated by the slackening of the 4 legged sling from a fully tensioned position. The bayonets twist approximately 90 degrees each time the 4 legged sling assembly is fully slackened and alternates between lock and unlock. The small diameter cable links the Autoloc® arm located near the center of the spreader to the master link. (This cable does not carry any of the lift load) The Autoloc® system linkage operates the bayonets each time the sling is slackened.